Hi, friends!! We made it to Friday. YES WE DID. The joy that I feel on Fridays is absolute true joy. It also backs up my way of thinking that the joy we feel really is all up to us and in our minds because are Friday’s that different from any other day? Not really for me. But somehow it just feels so RIGHT! Time for another volume of “Hey Jenica” where I answer some frequently asked questions. You can read volume 1 here! I feel like such a college professor right now telling you to go read volume 1. We are so sophisticated around here. I once read in a magazine that you should never match your lipstick to your outfit and that it should be a completely different and opposite color. Don’t listen to this advice, unless you want to look like a clown, in which case your goal is going to be accomplished easily. I don’t why anyone would recommend that, but now that I’ve had some experience in the “putting lipstick on my lips” arena, I highly disagree! I always apply my lipstick after my hair is done, after all of my other makeup is done AND after I’m dressed. I think it’s the finishing touch to any outfit and it makes me feel like I’m polished off and ready to face the day. I love this lipstick in the color “Snob” the very, very best out of all of my lipsticks. It keeps your lips super hydrated and it matches most easily with most outfits. It’s easy to apply and I get the most compliments and most “what lipstick are you wearing?” questions when I have this on. If you’re looking for a fabulously dark color, try this one in “Blackberry.” I love it!! It’s gorgeous. I LOVE it!! Tyler had to convince me to get one for two years. He said, “Do you like every other Apple product you own?” I said, “Yes.” I had no idea how much I would love it. My favorite features: 1) It tracks my calories burned, heart rate and miles gone in workouts. 2) I can “ping” my phone when I have no idea where my phone is at (which is at least 2 times a day…and that’s being generous). You hit a button on your watch and your phone makes a sound so you can remember that you left it on the highest shelf in your closet…like it’s normal. It’s a dream come true. 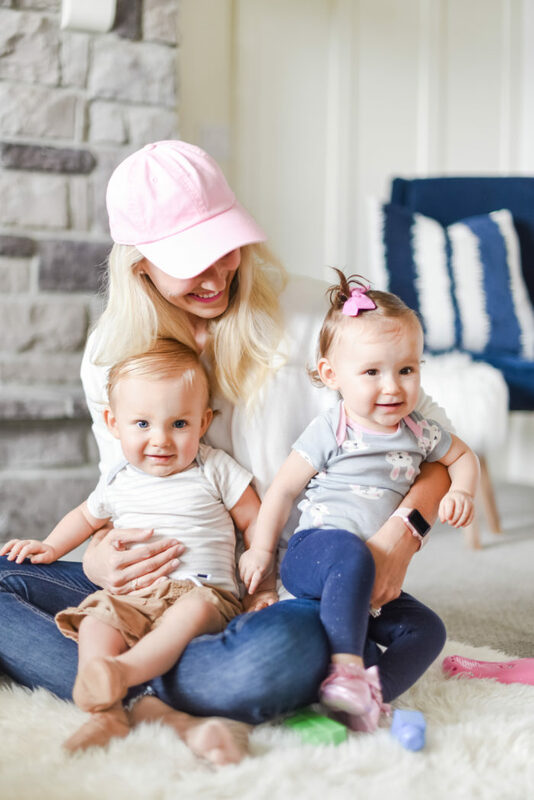 3) I can answer my phone from my watch and talk into when my hands are full (which is a lot) or my phone is upstairs and I’m under a dog pile of 2 babies on the main level. This is the one that I have and I’m in love with the blush pink. If you have any questions, please email me at jenica@asliceofstyle.com with the subject line “Hey Jenica” and I would love to answer them for you. Have a wonderful weekend, my beautiful people!! Previous Post: « The Best Tips for Road Tripping with Babies! Thank you for the podcast recommendation. I’m always looking for uplifting podcasts! You bet! I would love for you to share any that you love as well!